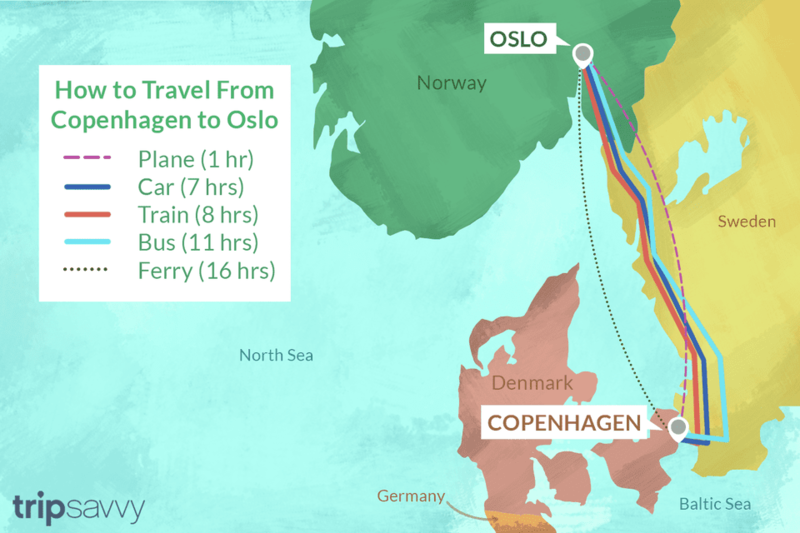 There are several types of transportation you can use to get from Copenhagen, Denmark, to Oslo, Norway, and back. Each option has its own pros and cons that may make it more or less suitable for your trip. Here's a look at the five travel options. With a flight time of just over an hour, flying directly from Copenhagen to Oslo is a time-saver. The pricing of this option is higher than bus fares, though, but still affordable, for airfare. This is a great option to get between Copenhagen and Oslo in about eight hours. The train is a comfortable and reliable method of transportation. It's more expensive than driving or taking the bus, though. Find online booking of unlimited, multi-country train passes at RailEurope.com. If you'd like to rent a car to get from Copenhagen to Oslo, you have two options. The fast option is a 600 kilometer (seven hour) drive using the Øresund Bridge and going north on the E20, turning onto the E6 toward Oslo in Göteborg. It's quick and pretty but costs gas and bridge toll. The second option is an 800-kilometer (10 hours) drive from Copenhagen to Oslo across Århus and Ålborg in North Jutland (E20 west/E45 north). Take the ferry from Hirtshals (or Frederikshavn) across the Skagerrak to Larvik and drive to Oslo from there. It's a scenic drive, but you'll have to submit to ferry schedules. There are several options here, among them a direct ferry connection from Copenhagen to Oslo in a whopping 16.5-hour trip with DFDS Seaways. It departs in each city daily, arriving the next morning. Prices depend on the type of cabin and season but tend to be cheaper than airfare. Other options include driving to the northern tip of Denmark and taking one of the ferries to Norway from there (see above option). Swebus Express bus line 820 is a direct bus connection of Ingerslevsgade in Copenhagen and Oslo's Bus terminal/Galleriet, with several stops in Sweden. It's a monstrous 11-hour journey, though. Weekday bus tickets are cheaper than weekends. Select the bus stops KÖPENHAMN (Copenhagen in Swedish) and OSLO. Pick this option if you're low on money and have time to spare.